How do I manage my trips and places? 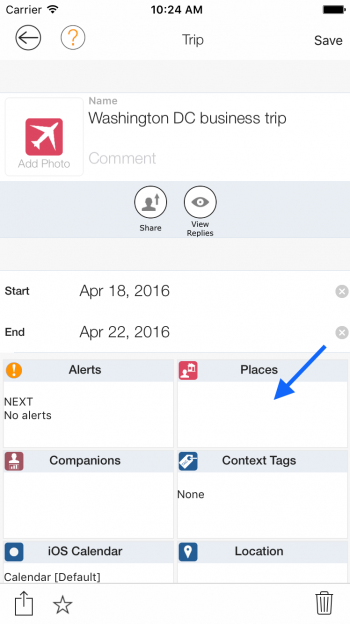 You are here: Home / LifeTopix / Common Questions / How do I manage my trips and places? 1. 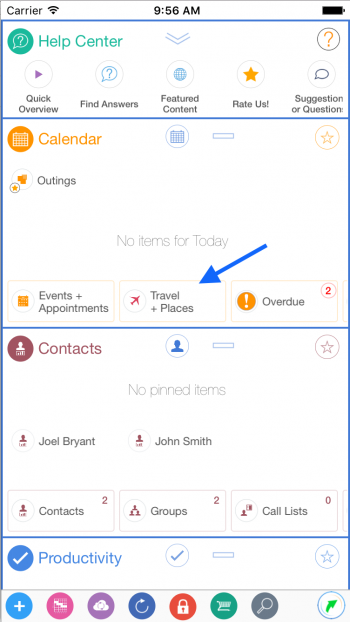 From the “Calendar” card tap the “Travel + Places” tile. 2. 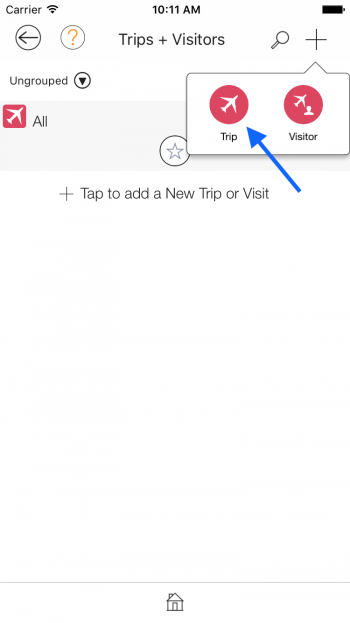 From the “Travel + Places” topic view you can view all your trips by tapping the “Trips + Visitors” tile. 3. 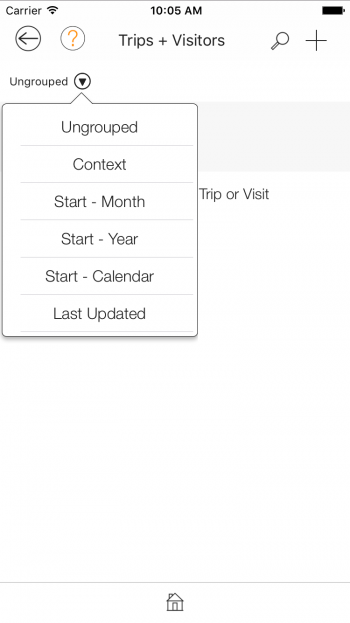 From this view you can group your trips and visits by tapping the dropdown button. 4. 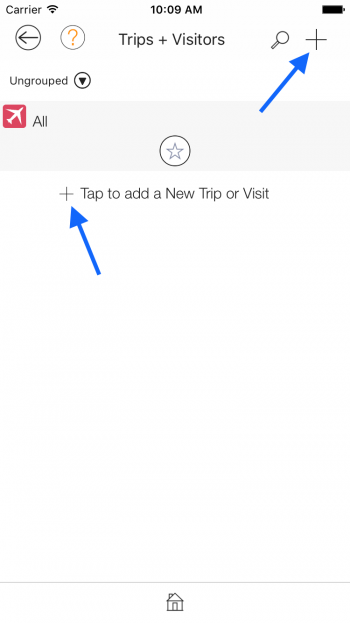 You can create a trip by tapping one of the ‘+’ buttons, and then tap the “Trip” button. 5. 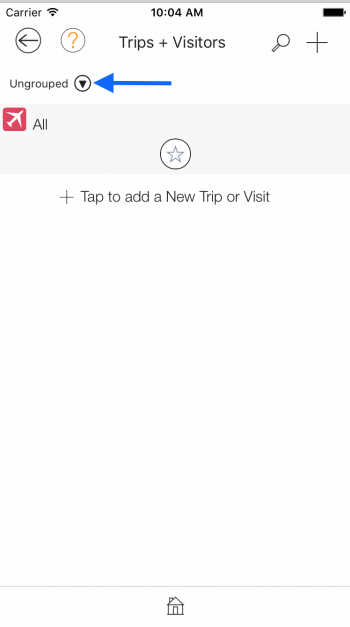 From the “Quick Trips” view enter a title for the trip and then tap the “Full Details” button. 6. From the “Trip” view set the “Start” and “End” fields. 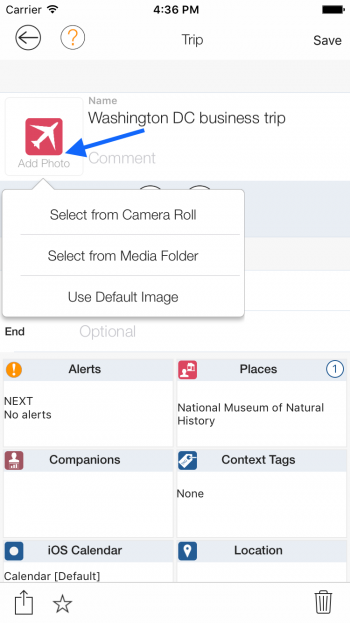 If you tap “Add Photo” that is next to the “Name” and “Comment” field you can add a picture to the trip. 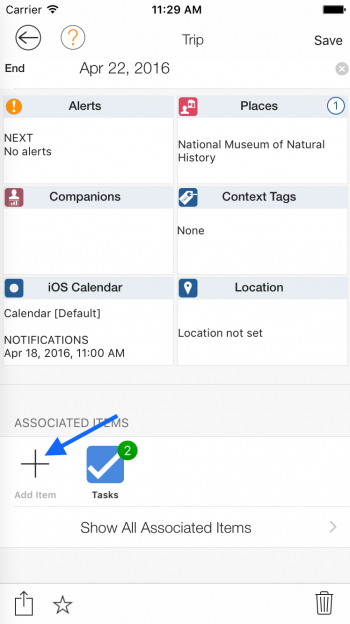 If the LightArrow Organizer App has permission to use the iOS Camera you’ll see an additional option called “Take Photo”. 7. 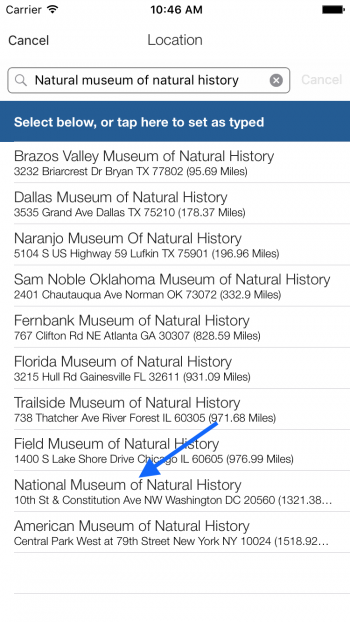 In the “Trip” view you can set places that you will be visiting such as museums, or the hotel you’re staying at. Next tap the “Places” tile. From the “Places” view tap the ‘+/-‘ button to add a place. 8. 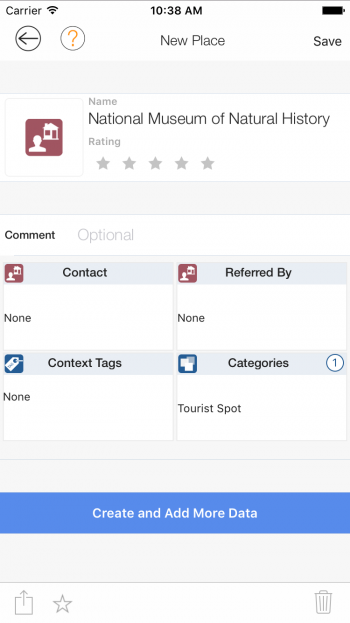 From the “Select Places” view you can select/unselect places that have already been created in this App or create a new place. 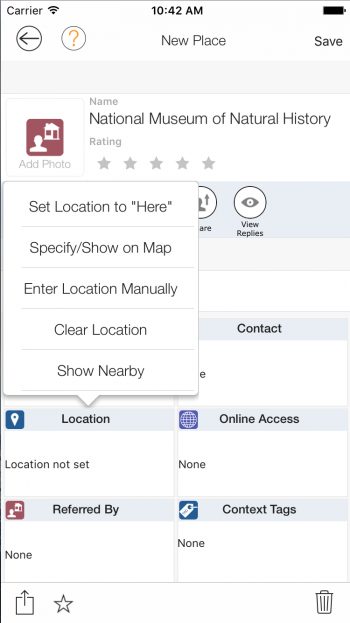 Tap the ‘+’ button to create a new place. 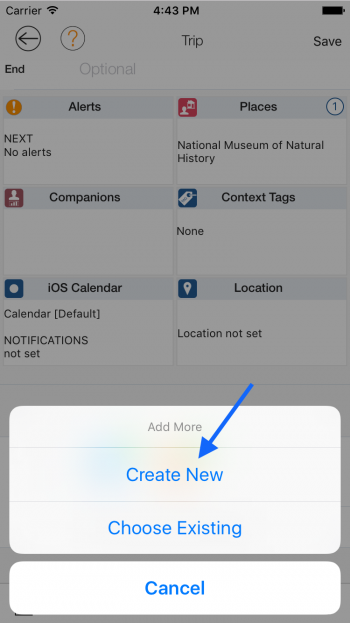 From the “New Place” view enter a name and then tap the “Create and Add More Data”. 9. 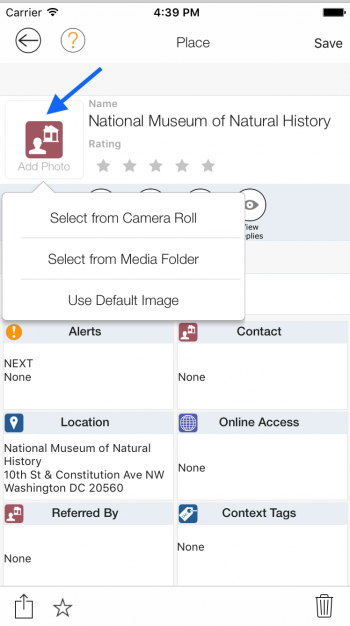 If you tap “Add Photo” that is next to the “Name” and “Rating” fields you can add a picture to the place. 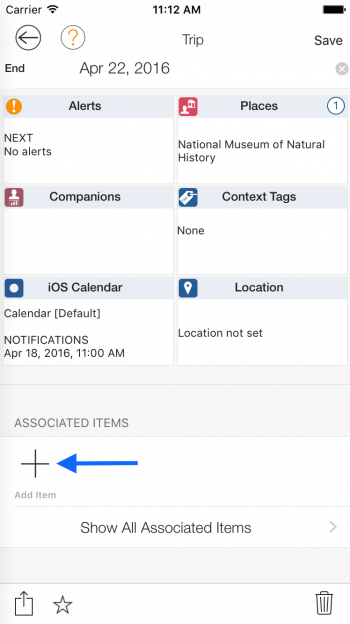 If the LightArrow Organizer App has permission to use the iOS Camera you’ll see an additional option called “Take Photo”. 10. 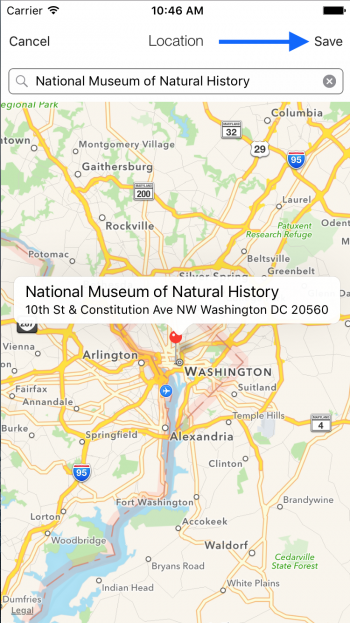 To set the location of the museum tap the “Location” tile and then tap “Specify/Show on Map”. 11. 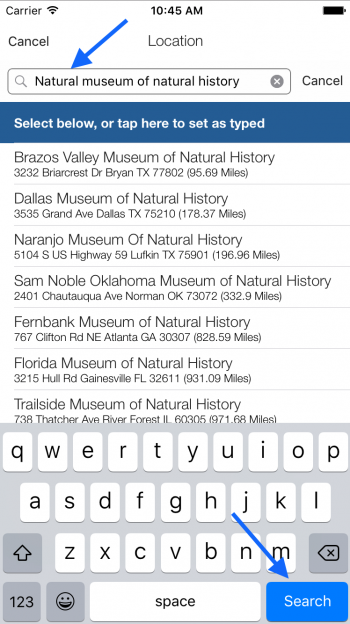 Then tap the “Search” field and type in the National museum of natural history, and then tap the “Search” button. 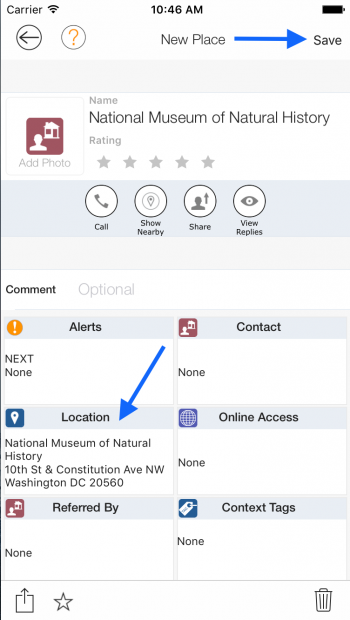 Then tap the row that says, “National Museum of Natural History”. Then tap the “Save” button on the “Location” view. Now on the “New Place” view you can see the “Location” is set. Tap the “Save” button on the “New Place” view. 12. 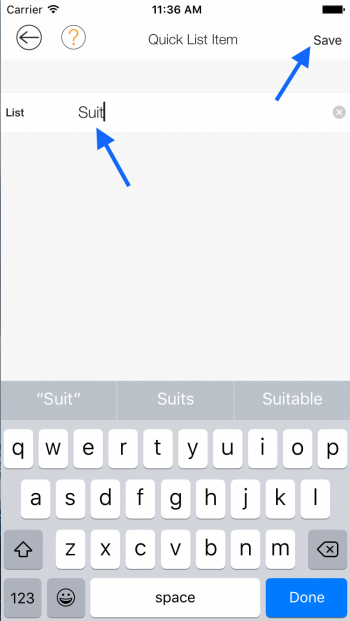 From the “Select Places” view tap the “Save” button. From the “Places” view tap the back button. 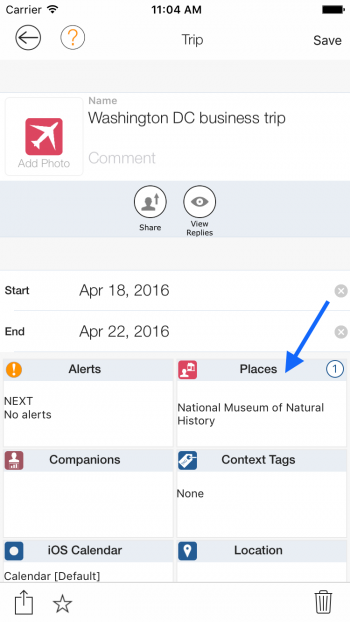 Now you can see the “Places” tile has a badge count and shows the place that was created and set for this trip. 13. 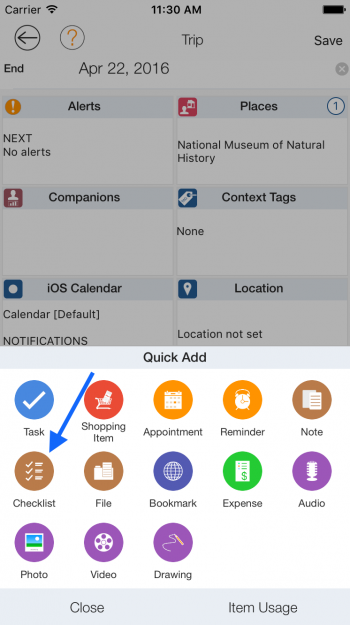 You can also associate items to the trip such as task, checklists, etc. 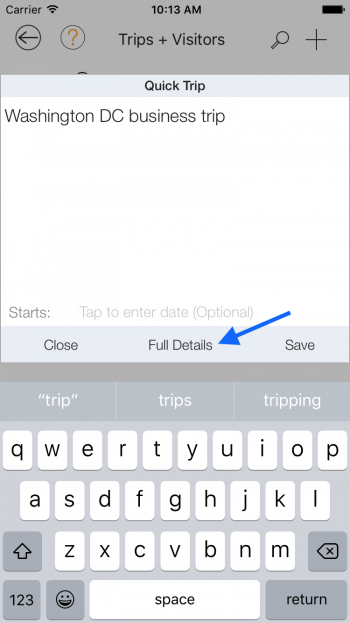 Scroll down on the “Trip” view until you see “Associated Items” and tap the ‘+’ button. 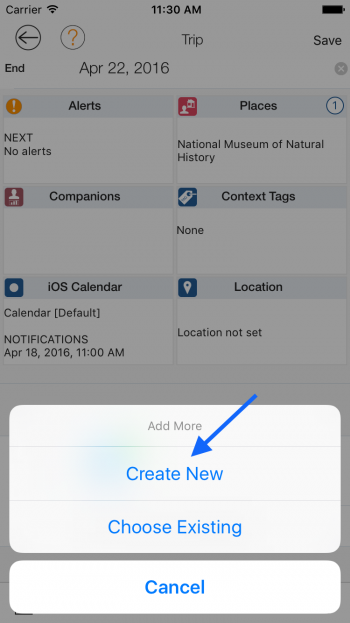 Then tap “Create New”. 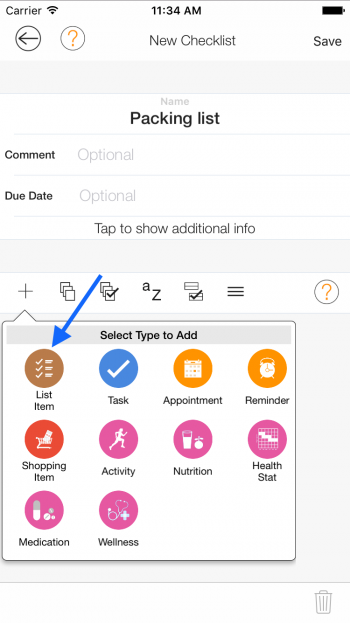 Then from the “Quick Add” tap the “Task” button. 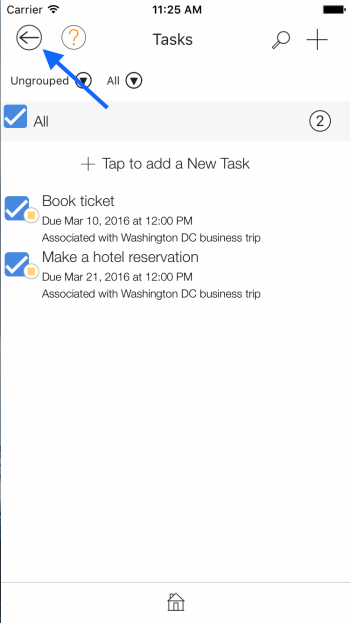 Enter the title of the task, in this example created a task to book a ticket for the trip and set the date when this needs to be completed by. Then tap the “Save” button. 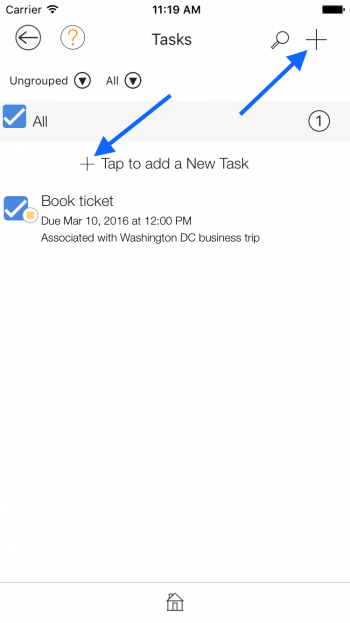 Now on the Trips view you’ll see a “Tasks” button with a badge count that displays the number of associated tasks for this trip. 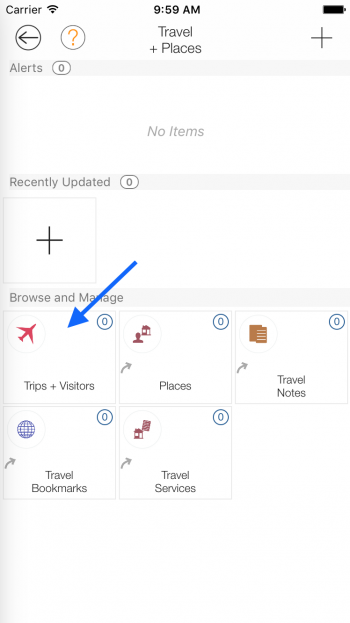 If you tap the button you’ll see a list of all the associated tasks for this trip, and you can create more tasks to associate to this trip by tapping the ‘+’ button. 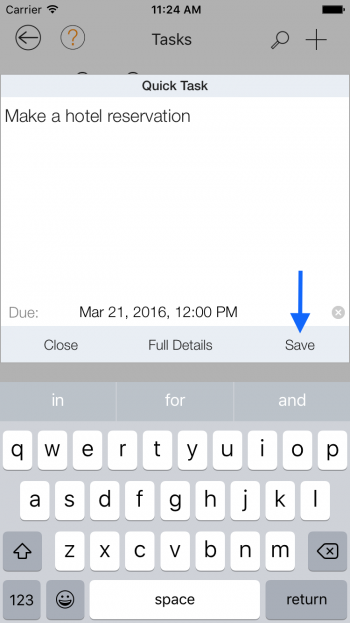 Enter a title for the next task, and tap the “Save” button. Then tap the back button to get back to the “Trip” view. 14. 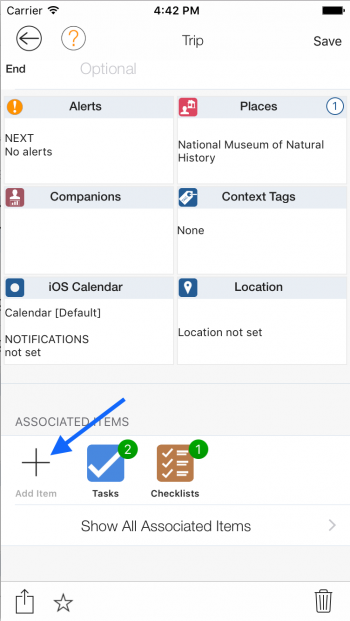 Next create a checklist and associate to the trip. 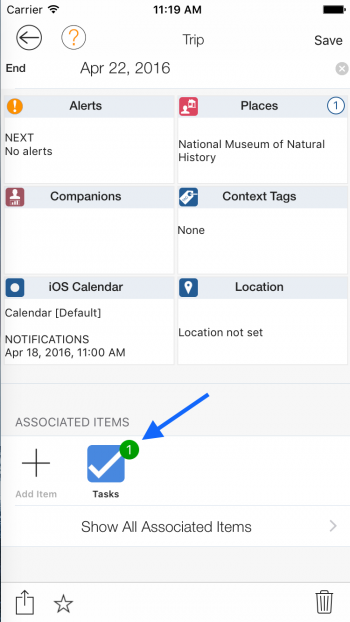 Click the ‘+’ button under “Associated Items” on the trip view. 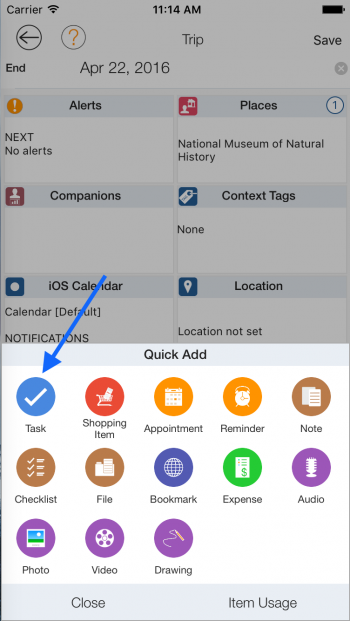 Then tap the “Checklist” button. 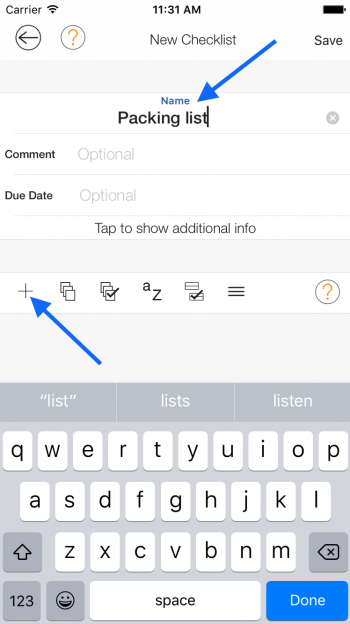 Enter a name for the checklist and then tap the ‘+’ button. 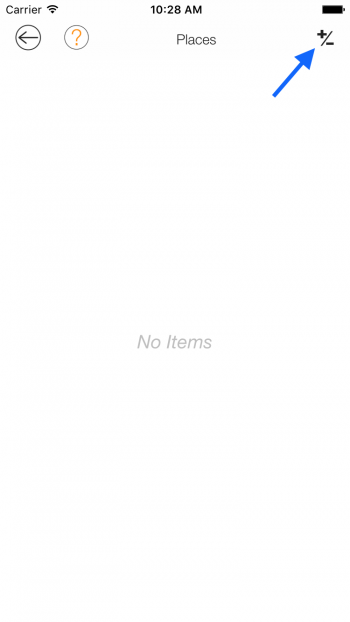 Then tap “List Item”. 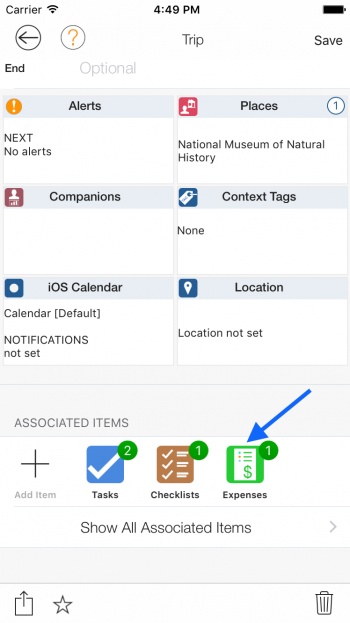 Enter the name of the item to add to the checklist and then tap the “Save” button. Repeat to add more items. 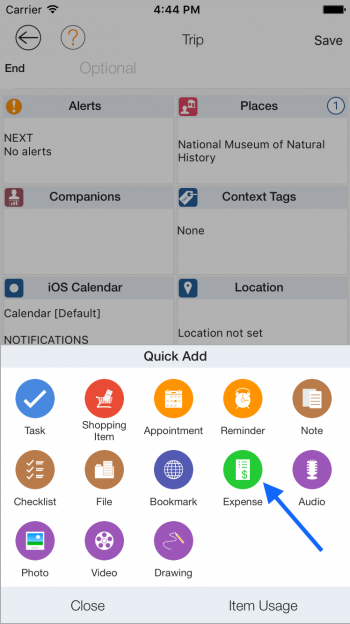 Then after you’re finished adding items tap the “Save” button. 14. 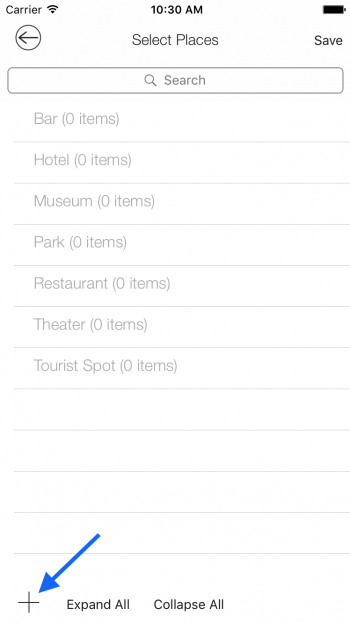 Also, you can create and associate expenses to the trip. 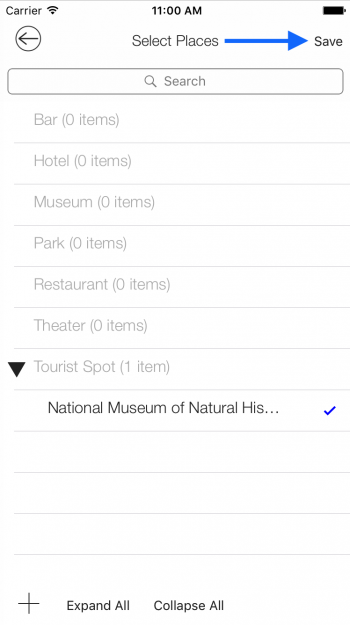 Click the ‘+’ button under “Associated Items” on the trip view. Then tap the “Expense” button. 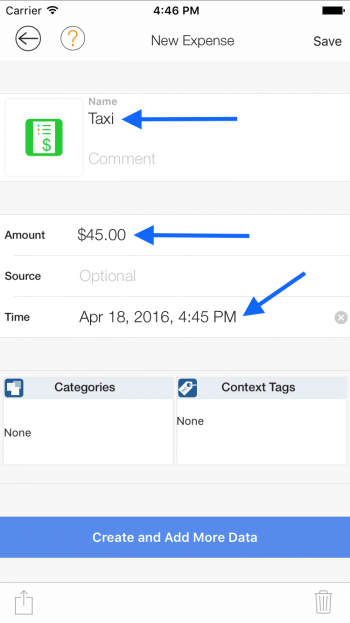 In the “New Expense” view enter a name for the expense, amount, and time of the expense. Then tap the “Save” button. 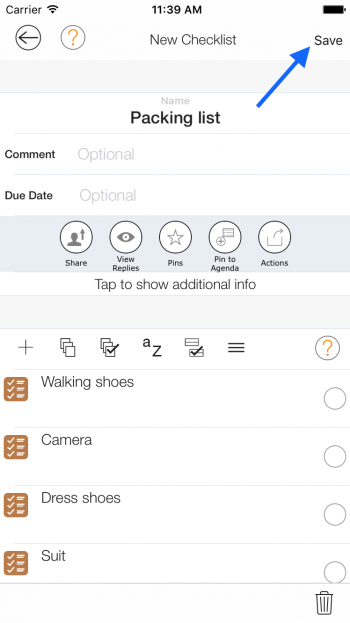 Now you can see a “Expenses” button with badge count.